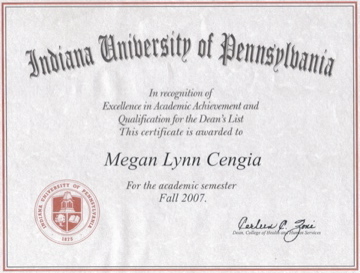 Megan Cengia is a senior at Indiana University of Pennsylvania (IUP).She is working toward a Bachelor of Science Degree in Nutrition following a Dietetics Track. She is expected to graduate in May of 2011. She is a dedicated student and she has made the Dean’s List one of seven semesters since she has been at IUP. Megan is a member of the American Dietetic Association and also a four-year member of the IUP Drill Team, and has been the team captain for the past three years. Megan is currently employed at Hopkins Chiropractic where she has held a Chiropractic Assistant position for the last two years. Megan is a hard worker and has been trained in all areas of the office. Megan has worked very closely with each patient as well as with patients participating in the Nutrition and Wellness plan that Hopkins offers, she believes the experience will help her to prepare for her future career. After graduation, Megan is hoping to complete a dietetic internship. Within the next two years I hope to have completed a dietetic internship through an accredited program. I also hope to already have taken the Registered Dietitian Exam, or be in the process of preparing to take the exam. After receiving my Registered Dietitian license I hope to work in an office that focuses on nutrition counseling and education. I hope to work with a variety of different ages, ranging from children to older adults. Five years from now I hope to still enjoy working with the counseling aspect of food and nutrition. Eventually I would like to start my own practice. I would continue to focus my practice on nutrition counseling, but in the office I would like to have a gym and fitness facility so that my clients would have a place of their own to work out in. I would also like to be able to coordinate some specific aerobic or dance classes with the workout program, so that I would be able to use my minor degree in dance in my business as well.